Apparently there is already a thriving market for gourmet dog treats, but these fancy biscuits sold in stores, catalogs and online can be quite pricey. 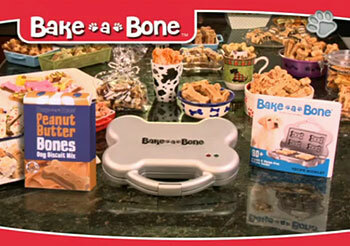 Bake A Bone is the product for the person who feels guilty that she cannot afford to buy these top-of-the-line snacks for her pet. 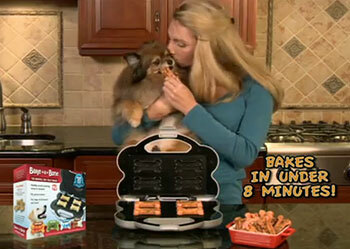 Now every dog owner is able to “keep up with the Joneses” in the gourmet dog treat arms race. Yuppies will be happy to learn that Bake A Bone can make “organic” and “gluten-free” dog biscuitswhich means infomercials for canine yoga videos will be coming to TV soon. This commercial promises BakeABone will make “prefectly shapped” dog treats and “you can even decorate them as you please.” I hate to break it to you, but an animal that nibbles its own poop and drinks out of the toilet is not going to mind a misshapen dog biscuit! A lot of dog owners eat dog biscuits themselves, so they are probably the ones who want banana biscotti and peanut butter flavored treats. 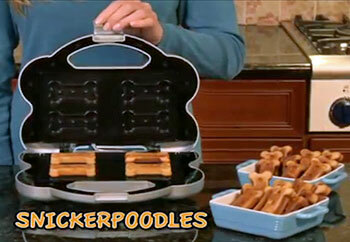 SnickerPoodles?? The secret ingredient is ground poodle meat! Ah, but can you use this to bake the poo into pleasing shapes?